Arriving in a new city always poses plenty of questions. How do you get to the city center? Which local SIM provider should you choose? Which hotels have great deals? All of this just got easier with Landed, the world’s first arrival app. 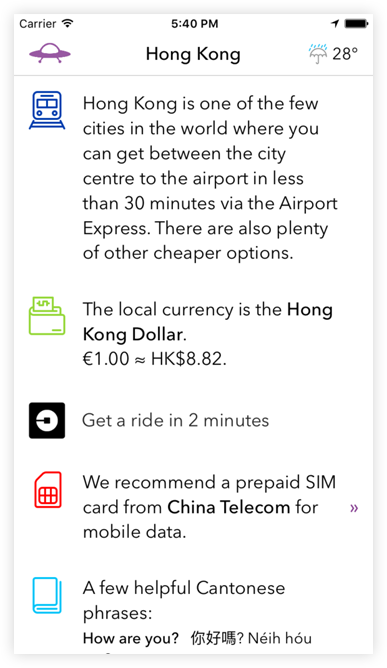 Landed gives you all the information you need to get off to a great start in a new city. Recommends the best way to get to the city center. Suggests the best local SIM card provider. Has awesome last-minute hotel deals in all major cities. Helps you settle in quickly by suggesting popular local phrases. To top it all, Landed is free to download. It’s time you get Landed!